This is the third and final article in a three-part series. The first article defined reusable transport packaging and its role in the supply chain, the second article detailed the economic and environmental benefits of reusable transport packaging, and this last article supplies some parameters and tools to help readers determine whether it is beneficial to change all or some of a company’s one-time or limited-use transport packaging to a reusable transport packaging system. When considering implementing a reusable transport packaging system, organizations must take a holistic view of both economic and environmental systems costs to measure the potential overall impact. In the operating expense reduction category, there are several areas where costs savings plays a key role in evaluating whether or not reuse is an attractive option. These include material substitution comparisons (single-use versus multi-use), labor savings, transportation savings, product damage issues, ergonomic/worker safety issues and a few other major savings areas. To help prospective users determine whether reuse is right for their company, the RPA has created a Reusable Packaging Economic Calculator to help determine the cost savings of switching from single-use corrugated packaging to reusable packaging. This and other comparison tools are available at http://www.choosereusables.org/library/calculators.html. A closed-or managed open-loop shipping system: Once reusable transport packaging is shipped to its final destination and contents are removed, the empty transport packaging components are collected, staged, and returned without a great deal of time and cost. Reverse logistics—or the return trip for empty packaging components—must be repeated in a closed-or managed open-loop shipping system. A flow of consistent products in large volumes: A reusable transport packaging system is easier to justify, maintain, and run if there is a flow of consistent products in large volumes. If few products are shipped, the possible cost savings of reusable transport packaging may be offset by the time and expense of tracking empty packaging components and reverse logistics. Significant fluctuations in shipping frequency or types of products shipped may make it difficult to accurately plan for the correct number, size, and type of transport packaging components. 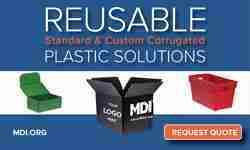 Large or bulky products or those easily damaged: These are good candidates for reusable transport packaging. Larger products require bigger, more expensive one-time or limited-use containers, so the potential for long-term cost savings by switching to reusable transport packaging is great. 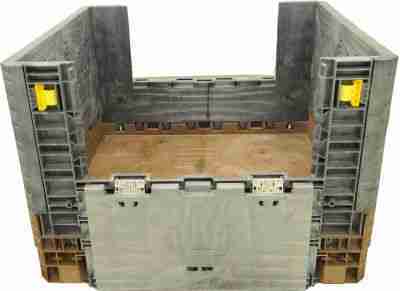 Suppliers or customers grouped near one another: These make likely candidates for reusable transport packaging cost savings. The potential to set up “milk runs” (small, daily truck routes) and consolidation centers (loading docks used to sort, clean, and stage reusable transport packaging components) creates significant cost-saving opportunities. Inbound freight can be picked up and consolidated for delivery on a more frequent just-in-time basis. Generally, a company should consider switching to reusable transport packaging when it would be less expensive than one-time or limited-use transport packaging, and when it is striving to reach sustainability goals set for their organization. The following six steps will help companies determine if reusable transport packaging can add profit to their bottom line. Develop a list of products frequently shipped in large volume and/or that are consistent in type, size, shape and weight. 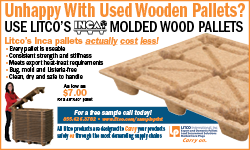 Estimate current costs of using one-time and limited-use pallets and boxes. Include costs to purchase, store, handle and dispose of the packaging and added costs of any ergonomic and worker safety limitations. Develop a geographical report by identifying shipping and delivery points. Evaluate the use of daily and weekly “milk runs” and consolidation centers (loading docks used to sort, clean and stage reusable packaging components). 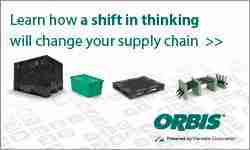 Also consider the supply chain; it may be possible to facilitate a move to reusables with suppliers. Review the various types of reusable transport packaging systems available and the costs to move them through the supply chain. Investigate the cost and life span (number of reuse cycles) of reusable transport packaging components. Based on the shipping and delivery points identified in the geographical report developed in Step 3, estimate the cost of reverse logistics in a closed-loop or managed open-loop shipping system. If a company chooses not to dedicate its own resources to managing reverse logistics, it can obtain the assistance of a third-party pooling management company to handle all or part of the reverse logistics process. – The estimated cost of reverse logistics from Step 5. Another viable option for making a comparison is the RPA’s Economic Calculator that is available on our website. It is based on a financial model that covers the key concepts in the comparison of the per container cost of both reusable and single-use packaging. The calculator was developed in cooperation with StopWaste.Org (www.stopwaste.org). The model compares basic cost differences of single-use corrugated packaging and reusable packaging. The calculator factors in corrugated costs, dwell time (how long containers are held at various stages of the supply chain), cartons shipped annually, annual interest rate, return miles for reusables, and the expected replacement rate. While the model uses factual inputs from prospective users, it is intended to offer guidance and not an absolute indication of exact cost benefits. Additional assistance is available from the RPA and our member companies. In addition to these quantifiable savings, reusable packaging has been proven to reduce costs in other ways, including reducing product damage caused by faulty containers, reducing labor costs and injuries, reducing space required for inventory, and increasing productivity. Whether your drivers are economic or environmental, there is a strong likelihood that incorporating reusable packaging in your supply chain will have a positive impact on your company’s bottom line as well as the environment.